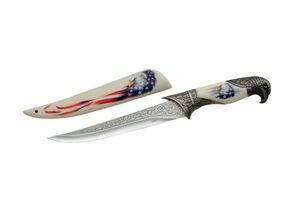 This fixed blade Eagle Knife has an engraved stainless steel blade with decorated sheath and handle. The sheath has the eagle head and american flag in bright colors painted on it. The handle is also painted with the eagles head and an eagle head pommel of metal. 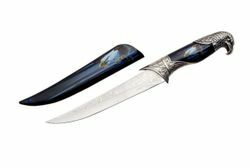 The blade is about 7.5 inches long with the entire knife being 13 and 13/16 inches long. The dark model has an eagle head on the sheath and handle on a black background. Quality is quite good for a knife this cheap.